HERE Maps, a division of the now phone division-lacking Nokia, will begin to prioritize iOS and Android development over its former partner Microsoft’s own mobile platform. While HERE Maps, one of four major providers of topographical data besides Google, TomTom and OpenStreetMap, will continue to be updated on Windows Phone for at least 10 years — that’s the length of the licensing agreement with Microsoft — more resources will be pooled into the top two mobile platforms going forward. “We’re having to wind down our Windows Phone app development and shift it over towards Android and iOS,” said Sean Fernback, SVP at Nokia’s HERE division, to TheNextWeb, blaming “the transaction” between Nokia and Microsoft completed this year. iOS and Android are obviously larger target audiences than Windows Phone, and the move is meant to offer Nokia’s extensive database of maps, public transit and traffic information to a larger number of people. Nokia is quick to stress that updates for the Windows Phone version will continue indefinitely, and that the more people adding crowdsourced information to the system, through the upcoming iOS and Android versions, the more accurate the data is for everyone. 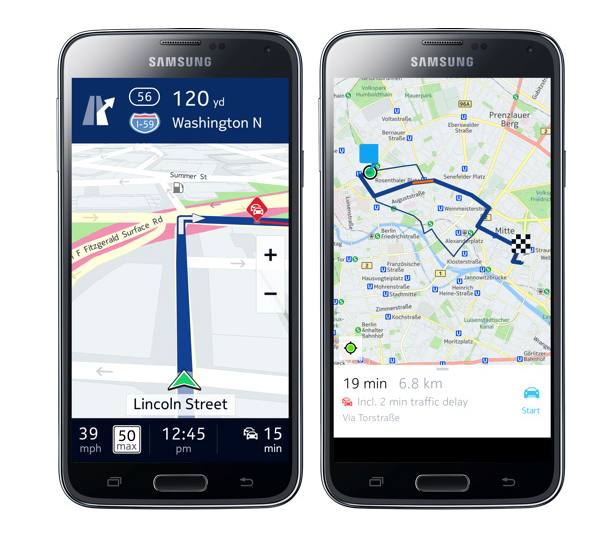 HERE Maps for iOS and Android will feature, like its Windows Phone counterpart, offline maps for entire cities, countries and even continents. Earlier this month, Nokia entered into an agreement with Samsung to be the exclusive mapping solution for the company’s upcoming Tizen-powered Gear S smartwatch, and as part of the deal HERE Maps for Android will debut on the Galaxy S and Galaxy Note series for an undisclosed amount of time.